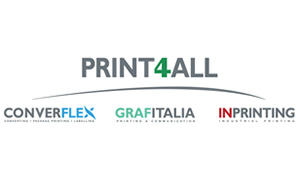 For Temac, the participation to Print4all not only exceeded the expectations, but it was more than satisfying in terms of contacts, collaborations and concrete developments. Despite the large turnout of the Italian basin, a good 42% of the total contacts came from abroad, in particular from Russia, Ukraine and North Africa, confirming the importance of these strategic markets for Temac. Much interest has aroused the new slitter of SRS series, shown for the first time. The design of the front slitter, which can rewind up to diameters of 600 mm is certainly an interesting compromise between size of the machine and production space. Another “star” was the last-generation unloading system, mod. SF18, with orthogonal movement and down-to-ground or pallet positioning, to facilitate the handling of finished reels. 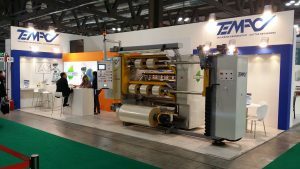 Thanks to this event, Temac has been able to present also the latest technological innovations in step with the ERA 4.0. and confirm the live motive of all its activities: respect for the environment. By now all the Temac slitters bear the Ecosystemac brand, which certifies the yield and the eco-sustainability of the products, to which the 4.0 logo has now been added. The company, founded in 1999, continues its growth, investing in the construction of a new production site on a covered area of more than 2000 m², which will host offices, production, T.D., R&D and logistics, to ensure a better production environment for employees, a new image and a better service for their customers.